I received free PlayTape products in exchange for a review. All opinions are my own. Are you looking for great play ideas for bad weather days with rain and snow? 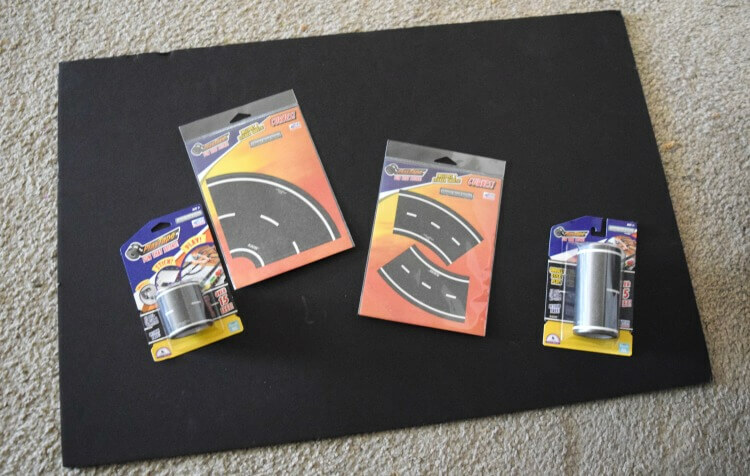 I have just the thing – a DIY Road Trip foam board with PlayTape! PlayTape comes in two widths, 2-inch and 4-inch, and is perfect for any die-cast cars and more! There’s even curved pieces, too. It can be used on any flat surface, is easy to tear, and is easy to re-position. Plus, it comes up with no residue. and it’s recyclable! It would work great on a smooth floor like linoleum or maybe even wood flooring. We only have carpet and ceramic tile in our house, so there wasn’t a smooth service to apply it. I thought foam board would work great. My little girl LOVES dolls, and she loves cars, too. She’s always creating ramps out of books and boxes to send her Paw Patrol cars on a mission to save someone. 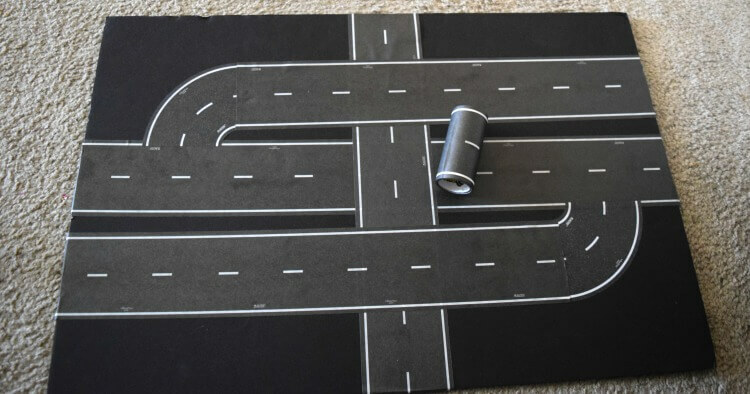 When InRoad asked me to check out their PlayTape, I knew exactly what we had to do — make a DIY Road Trip she can use with her cars. 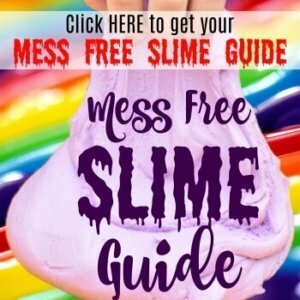 This is so easy and will get hours of play! She was able to easily help me tape the board. Then, once it was finished, she created herself a whole city on the foam board with extra parts from a old train set like stop signs, trees, and more. She even pulled out a roll of duct tape and made sidewalks for the people. You can even take PlayTape along with you in your purse to pull out and let your child’s imagination come to life! It’s for ages 3 and up, including adults, too! It’s also made in the USA. You can find PlayTape for $3.97 for 30 ft in the middle of the toy car aisle at Walmart. PlayTape® from InRoad Toys is now available in over 3,100 Walmart stores across the USA. Check to see if your local Walmart carries PlayTape. Here’s a special deal! Right now you can get the curves for FREE! InRoad Toys is having a “Picture Yourself with PlayTape” promotion in Walmarts where PlayTape is sold. All you have to do is take a selfie in the Walmart with PlayTape and send it in an email. Then, you get a pack of PlayTape Curves for FREE! See the details HERE. That is such a cute idea. My son used to love to play with his Hot Wheels, and this would have been perfect for him. This is such a cool concept! I love that you can move the tape so the kids get more variety. My son would love this! What a fun idea! Kids could get pretty creative with Play Tape, I love what you’ve done with it. How fun! My son would’ve loved this when he was younger. I wish he was still young enough to appreciate this. My son loved playing with his Hotwheels cars when he was little. He had a track similar to this. Why did I not think of that when my kids were little, that is a such a great idea. My son is big now and I kinda miss seeing him playing with his hot wheels. thats nice and super cool! i like the idea, im sure my son will like this too:~! What a smart idea. So simple but perfect. I bet the kids love it. This looks like so much fun! My nephew would absolutely love this! Thanks for sharing it! 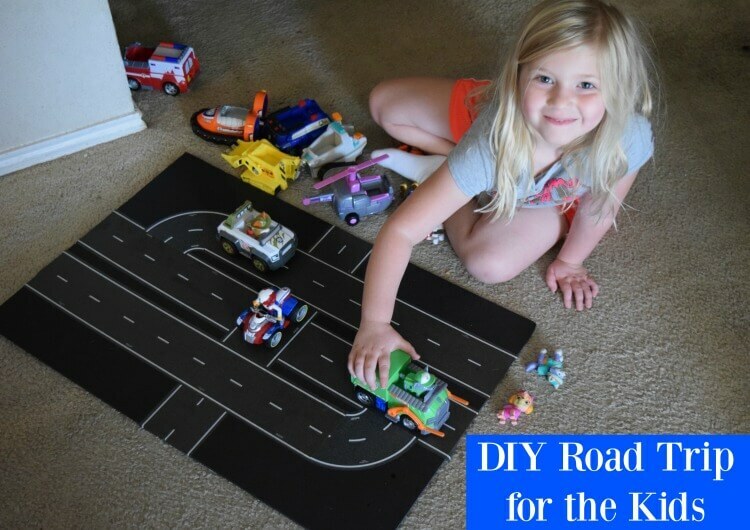 great DIY road trips since my son loves cars! i would like t try this one! This is pretty cool. I always loved playing with cars when i was litttle. I need to get my daughter some. This is so cool. My kids would love making this and playing with it. Great idea. That is such a fun and brilliant idea! How come I’ve never thought of that?! 🙂 Thanks for the idea! Love it! what a clever invention, some parent was thinking when they created this : ) my kids would LOVE this! thanks for making me aware of this great product! Oh that is so neat! 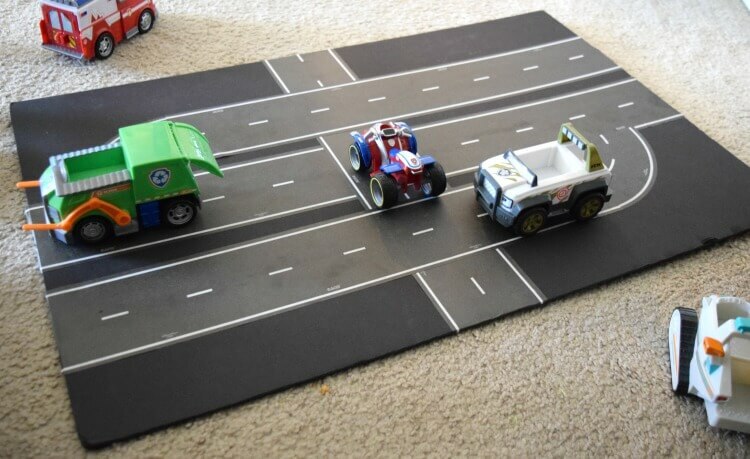 My son used to be so obsessed with his toy cars. Now he’s all about his Lego. His little sister loves playing with the cars now so might do this for her.